The hop-on, hop-off Canal Bus of AmsterdamThe trams and buses of Amsterdam are wonderfully efficient, but imagine getting about instead by water aboard a hop-on/hop-off Canal Bus (www.canal.nl). The boats chug along popular canals, following four color-coded routes (detailed below) and 20 stops at or near major sights, museums, monuments, and squares. Once you buy a ticket (€20 for the day, €22/$32 for 24 hours, €33/$48 for 48 hours—though about 13% cheaper if you buy online through Viator.com), you can the boats as often as you like, jumping off to do some sightseeing, then back on the next one to continue along (they pass every 35–60 minutes, depending on time of year and route). The same company also runs smaller Canal Hopper boats that can get into smaller waterways, and rents Canal Bikes (essentially paddle boats seating up for four). 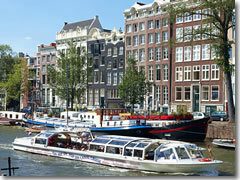 Canal cruises: Viator.com, Amsterdamcanalcruises.nl, Hir.nl.